Ten University of Mississippi students were inducted into this year’s Hall of Fame in a ceremony at the Gertrude C. Ford Center for the Performing Arts on Friday afternoon. Photo by Kevin Bain. OXFORD, Miss. 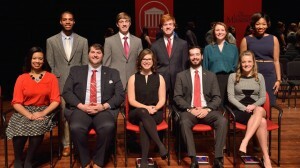 – Ten University of Mississippi seniors have earned membership in the school’s 2014-15 Hall of Fame, one of the university’s highest honors. The Hall of Fame inductees were honored Jan. 30 in a ceremony at the Gertrude C. Ford Center for the Performing Arts. Recipients are chosen by a committee in accordance with ASB policy, with selections based on a student’s academic achievement, community service and potential for future success. New Hall of Fame members are Rob Barber of Hernando, Marcus Daniels of Brandon, Christine Dickason of Collierville, Tennessee, Channing Lansdell of Nettleton, Briana O’Neil of Brandon, Davis Rogers of Jackson, Ashley Saulsberry of Nesbit, Anna Kathryn Suggs of Kingwood, Texas, Phillip Waller of Madison and Emily Wikle of Fishers, Indiana. “If you go to the Ole Miss Union and look at the photos of the previous inductees hanging on the wall, you quickly realize that today’s Hall of Fame honorees will join those that came before them as major contributors to our state, our country and our world,” said Brandi Hephner LaBanc, vice chancellor for student affairs. “Simply put, these are students who will become trailblazers. They have contributed to our campus community in meaningful and bountiful ways. The 10 students, along with 156 other Ole Miss seniors, were also recognized for inclusion in Who’s Who Among Students in American Universities and Colleges. They are to be listed in the national publication’s 2015 edition. 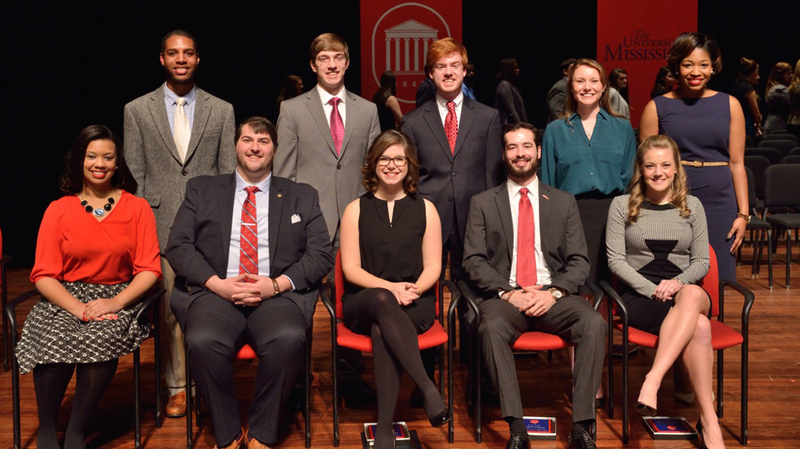 Barber, a public policy leadership major, was selected as the university’s 2014-15 Mr. Ole Miss. He is a member of the Sally McDonnell Barksdale Honors College and served as sophomore student senator and student director. He served as an orientation leader, an Ole Miss Ambassador and a Columns Society member, a group of 24 students who serve as official hosts to the university. Barber held several leadership positions within the Associated Student Body, including a senator from the College of Liberal Arts and the director of outreach. He is a member of the Ole Miss Model United Nations team, Mississippi First, College Democrats and active in Reformed University Fellowship and Delta Psi fraternity. Barber is a founding member of RebelTHON, a 12-hour dance marathon that raises funds for LeBonheur Children’s Hospital, and serves as director of social media for the event. He participates in UM’s Big Event community service project and volunteers as an English as a Second Language conversation partner. After graduation, he plans to attend medical school with an interest in psychiatry. His parents are Bob and Karol Barber. A biological science major and a member of the Sally McDonnell Barksdale Honors College, Daniels held leadership positions with the Columns Society, Associated Student Body, Lambda Sigma and the Black Student Union. He is a member of several service organizations, including the UM Big Event. He also volunteers for More than a Meal and MANNA, two organizations that feed needy people in the Oxford community. Daniels held a summer research internship with the University of Mississippi Medical Center Health Disparities unit, conducting research on stress and the immune system. He was a part of the University of North Carolina at Chapel Hill’s Summer of Learning and Research Internship studying cystic fibrosis. After graduation, Daniels plans to attend medical school. His parents are Michael and Glenda Daniels from Brandon. Dickason is a public policy leadership major and a member of the Sally McDonnell Barksdale Honors College. A Taylor medalist and Truman Scholarship finalist, she was on the Chancellor’s Honor Roll every semester. She was a research assistant and wrote opinion pieces and columns for The Daily Mississippian. Dickason held leadership roles with the Associated Student Body, Ole Miss College Democrats and Mississippi First, and served as the student director and chair of staffing for the UM Food Bank, which helps those in need within the university family. She is completing an internship in Washington, D.C., this semester. After graduation, she plans to pursue a master’s degree in public policy. Her parents are David and Karen Dickason. As a part of her senior thesis for the Honors College, Dickason made a documentary film about education and college preparation in public schools in Mississippi. The film, “The Way I See It,” will be a part of the Oxford Film Festival Feb. 26-Mar. 1. Lansdell is an accountancy major, a member of Sally McDonnell Barksdale Honors College and a Luckyday Scholar. He held leadership roles in Omicron Delta Kappa and Lambda Sigma honor societies. He served on the Associated Student Body and the University Judicial Council and is active in his fraternity, Delta Psi. His numerous service projects include participating in a trip to New York City with the Honors College to help organize the annual “Aid for AIDS” fundraiser. Lansdell is completing a tax internship in real estate and asset management with KPMG in New York this semester. After graduation, he plans to attend law school. He is the son of Bill Lansdell. A public policy leadership major, O’Neil is a member of the Sally McDonnell Barksdale Honors College, a Trent Lott Leadership Scholar, a member of Phi Kappa Phi honor society and on the Chancellor’s and Dean’s lists. She served as an Ole Miss Ambassador, orientation leader and a member of the Columns Society. O’Neil is an active member of the Black Student Union, having served as the organization’s president. She played an instrumental role on the Black Leadership Council and on the Black History Month Planning Committee and the Black History Month Gala. O’Neil is involved with a number of community service initiatives, including Relay for Life, Leapfrog and Habitat for Humanity. She also served as the director of volunteer recruitment for the Big Event, UM’s largest community service effort. After graduation, O’Neil plans to attend law school and pursue a career as a trial attorney. Her parents are James and Quanya O’Neil of Brandon. Rogers is a physics major and recipient of a Taylor Medal. He is this year’s Associated Student Body president and also has served as a senator, a freshman focus member and director of academic affairs on the ASB executive cabinet. He is a member of the Columns Society and active in his fraternity, Sigma Nu, serving in numerous leadership positions within the organization. After graduation, Rogers plans to attend medical school. His parents are Jonathan and Dara Rogers of Jackson. Saulsberry, a biology major, is a first generation college student. She is a member of the Columns Society, a Luckyday Scholar and a member of IMAGE: Increasing Minority Access to Graduate Education. She active in her sorority, Alpha Kappa Alpha, serving in numerous leadership roles, and also held leadership positions with the National Pan-Hellenic Council, Omega Phi Alpha service organization and the Big Event. Saulsberry is an Ole Miss Ambassador, an orientation leader and part of the Ole Miss FasTrack program, which helps first-year students transition from high school to college in a supportive environment. After graduation, she plans to attend graduate school and dental school and pursue a career in pediatric dentistry. Her parents are Cubby and Cheryl Saulsberry of Nesbit. Suggs is public policy leadership major. She is president of Mortar Board Senior Honor Society, a member of Phi Kappa Phi and on the Chancellor’s Honor Roll. Suggs is active in Moneythink, a financial literacy program, having served as a mentor, vice president of recruitment and vice president of external relations. She serves a tutor on campus at the FedEx Student Athlete Success Center and in the community at LeapFrog, an after-school tutoring program serving at-risk students. Having served as the campus campaign coordinator for Teach for America, Suggs plans to spend two years with Teach for America after graduation in the Mississippi Delta. She is the daughter of Alvin and Anita Suggs. A journalism and public policy leadership major, Waller is a member of the Lott Leadership Institute, the Sally McDonnell Barksdale Honors College and a Taylor Medal recipient. His academic, leadership and service organizations include the UM Big Event, the university’s largest community service project, Relay for Life and Mortar Board, holding leadership positions in each organization. Waller is a contributor to The Daily Mississippian and editor-in-chief of the Ole Miss yearbook, previously serving as photography editor. His work earned him an award for the Best Non-Fiction Magazine Article and first place in the On-Site News Photography Competition at the Southeast Journalism Conference. After graduation, Waller is considering law school and graduate school in Washington, D.C. His parents are Ronald and Deborah Waller. Wikle is an elementary and special education major and the university’s 2014-15 Miss Ole Miss. She is a member of a number of honor societies. Her volunteer service includes the UM Big Event, the university’s largest community service project, Habitat for Humanity and coaching a special needs cheer team at the North Mississippi Regional Center. Wikle is an active member of Alpha Omicron Pi sorority. She was an orientation leader and a member of the Columns Society. Inspired by a child with leukemia in her hometown, Wikle founded the Columns Society’s philanthropy, Rhythm Pax, which coordinates delivery of therapeutic instruments to patients at Blair E. Batson Children’s Hospital in Jackson. President of the Ole Miss Running Club, Wikle participates in races in support of leukemia patients and raises funds for the Leukemia and Lymphoma Society through the Team in Training program. After graduation, she plans to pursue a career in special education and possibly attend graduate school. Her parents are Brian and Connie Wikle.